Is That a Stink in My Sink? No, it isn’t your trash can. 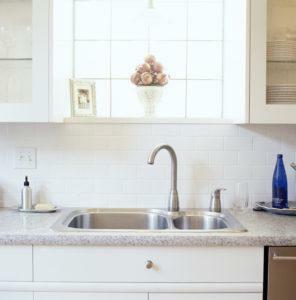 If you enter your kitchen and notice a distinct foul odor, you may want to check out your kitchen sink’s drain. Though many homeowners have a garbage disposal, it’s inevitable that food particles and other debris somehow get stuck in your drain, out of sight and out of mind – at least until it begins to stink. Usually, a bad smell from the drain is a result of food rot or bacteria growing in the moist conditions of your pipe. Before you pull out the harmful chemicals, though, you may want to consider solving your smelly problem with more natural cleaners that almost anyone can whip up from household items. How Do I Clean Out the Stink? There are plenty of quick, simple ways to rid your sink of nasty smells. Most homemade odor-eliminating cleaners will include elements that add heat, abrasion and acidity to break down bacteria buildup and harsh smells. Boiling water is the first step to get rid of mild odors. The heat can help soften and wash away any leftover particles in the drain. Just dump the boiling water down the drain after making pasta or tea to maintain a clean sink. Baking soda, vinegar and boiling water are the dream team of natural cleaners. Dump a bubbly solution of one part baking soda, two parts vinegar down the drain and let it sit a few minutes before rinsing it with a kettle of boiling water. Salt is a great abrasive element that can further clean out drains. Add a half cup of salt to a baking soda and vinegar mixture to scrub a pipe clean. Lemon juice allows you to skip the vinegar smell without sacrificing bubble power. Replace vinegar in a baking soda solution with lemon juice for a fresher smell. Essential oils add lovely scents to cover up any foul odors. Dump a half cup of baking soda down the drain and a few drops of your favorite essential oil followed by a pot of boiling water for a cleaner, fresher-smelling drain. If your kitchen stinks are coming from the garbage disposal, you can mix and match all of the above solutions and grind some ice for extra scrubbing power! Take control of pesky drain odors with these easy, natural household cleaners. If, however, you begin to notice these methods are no longer cutting it, it may be time to call in the professionals at Bonney Plumbing, Heating, Air Conditioning and Rooter Service. Our expert plumbers will track down the root cause of your sink’s odors quickly and help you keep your drains smelling fresher longer. To schedule your plumbing services, contact us online or call 800-444-0551.